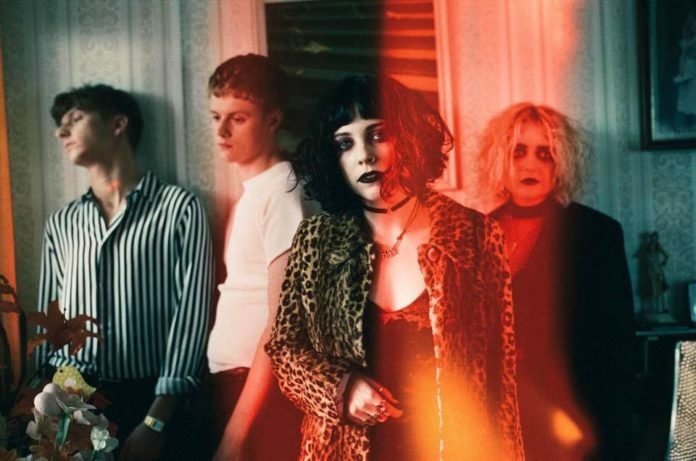 Pale Waves' latest single “Television Romance” is a slice of dark, shimmery pop, so it's no surprise the music video should take a matching tone. It's been given a music video as well, a month after the track made its initial debut. The band enlisted the 1975's bombastic lead vocalist and rhythm guitarist Matty Healy to put together an appropriately low-key music video for the track. It's out now, marking Healy's first sojourn as a director. The video features the band crooning along to the single in a refreshingly retro living room, not unlike something you'd see in your grandmother's house. It's actually very soothing. If you look closely, you can even spot a painting featuring Nipper, the RCA dog. It's a good foil for the less-than-uplifting lyrics, speaking on a romance that just doesn't seem to have blossomed between two individuals, like one you might see on TV. In addition to dropping the video, Pale Waves are also embarking on a North American tour, with tickets going on sale this Friday at 10 a.m. local time. If you've been yearning to hear the stylings of Heather Baron-Gracie but couldn't yet travel overseas, you'll finally have a chance to when the tour kicks off this November in Philadelphia, PA.
“Television Romance” is poised to release on 7″ in tandem with Pale Waves' previous effort “There's A Honey,” both of which were also produced by Healy. The band is currently at work on a full album that's meant to debut this summer, so if you're digging what they're putting down as well as Healy's directorial debut, you'll definitely want to keep your eyes and ears open as we cruise on into October.